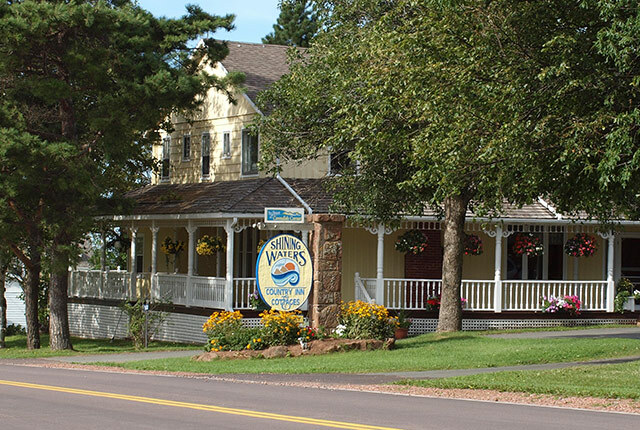 The Shining Waters Country Inn dates back to the 1850’s. It was the home of Pierce and Rachael MacNeill and is closely tied to the life of author Lucy Maud Montgomery. Many “Anne” fans and L.M. Montgomery scholars from all over the world visit the Inn each year. Two newer wings have been added since the building was opened as a Country Inn. Click on the “History” button below for full history. The Inn now contains seven “regular” rooms and six luxury suites. Regular rooms have either double, or twin beds (there is 1 queen). 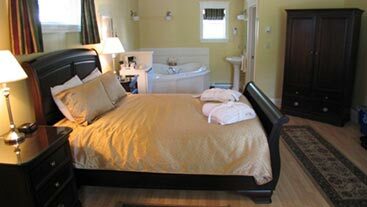 The suites all have queen sleigh beds and there is also one king suite. Room rates include a continental breakfast served in our beautiful breakfast room. 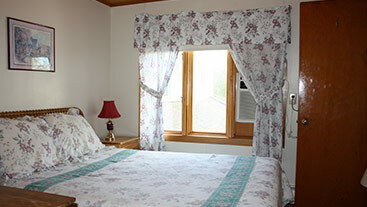 Each Inn room features a full 4-piece private bath, air conditioning and free high speed wireless internet. The luxury suites feature luxurious hardwood furnishings and seating areas. Some units also have fireplaces and large whirlpool tubes. Three of our luxury suites are located in a separate “gatehouse” building directly adjacent to the Inn. The main Inn building features a large grand room with fireplace and seating, a beautiful wrap-around veranda with seating and porch swing plus a large deck with tables and chairs for gatherings. Inn guests have full access to all Resort amenities including our 7 acre site, 2 pools and exercise room.